Today I’m thrilled to offer a guest post from author Angela Isaacs, author of one of my favorite Orthodox board books, Goodnight Jesus. Her most recent book, I Pray Today, has recently been released. 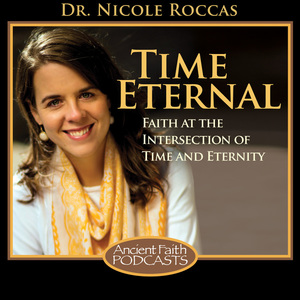 Below, she shares more about her new book and the role of time in children’s books. When my daughter was little, she didn’t have a good sense of time. If you told her you were going to the pool tomorrow, chances are you would find her struggling into a bathing suit a few minutes later. A friend’s son also struggled with time. So when they were counting down to Christmas, she started describing it as the number of “sleeps” until Christmas. It worked great until they got down to Christmas eve – 1 sleep left. He woke up from his nap convinced it was Christmas. Nothing could convince him otherwise. Time is a tricky concept for kids. They can’t see time or hold it in their hands. Even we adults have to rely on cues to tell us about time – clocks tick, the sun moves, day turns to night then back again. Without these cues we get confused: we know time is passing, but we don’t know how much. Cues don’t work for young kids, though. When my daughter was two and struggling with time, we used the sun as a marker for her. We told her she shouldn’t get up until the sun woke up (sunrise) and when the sun went to bed (sunset), it was time for her to go to bed, too. It worked brilliantly for a few weeks in spring. Then the days got longer and suddenly our daughter thought 4am was an ok wake time and 9pm was bedtime. Oops. Most little kids won’t notice the shift in day length through the year (like mine didn’t). They may not even be fully aware of the day/night cycle if an adult doesn’t point it out. After all, in the summer it’s already light when they wake up. (We hope, anyway.) And they go to bed before dark. In the winter, they’re usually bundled inside a warm house and don’t see the change. Other cues don’t work either. Toddlers can’t read the numbers on a clock and even we adults don’t often notice the sun moving across the sky. For a few years, kids are trapped in the eternal present. That makes the world a scary, unpredictable place. They’re hungry and have no idea if dinner is coming in two minutes or two hours. Waiting for a favorite blanket to wash or a grocery trip to end may well seem like an eternity. And to have someone tell you the best day of the year, Christmas is coming soon but have no idea when… I would meltdown, too. Regular routines help a lot. When the events of the day follow a predictable pattern, it eases children’s fears and gives them reasonable expectations. Children learn to relax into these routines. I think this is why books for toddler and babies often have this rhythm of time built in. They expose the comforting rhythms of the day so that children can see the hidden patterns. Their lives become less unpredictable. My new book, I Pray Today, is a thoroughly Orthodox take on the genre. It follows a full day’s rhythm but grounded in prayer: from a waking prayer to bedtime prayers. It also hits all the time-markers in between where you might pray: mealtimes, playtimes, bedtime, and others. Prayer is another way to add rhythm to a day – by periodically reorienting toward God. One of the pages from _I Pray Today_. Other board books focus on just one part of the day. Bedtime books are particularly popular because it’s the most stressful and anxiety-prone part of a child’s day. By now your toddler who was so sweet at breakfast has burned through her daily store of patience and tolerance. Add some scary shadows to this overall crankiness and it’s not a good recipe. Parents, too, are feeling run down. It’s been a long day and we’re want to punch out of the parenting clock. But first we have to get this cranky little person to sleep. Quite a challenge. Again, the rhythm of routine is like a steady lullaby to overtired and overwhelmed children. It’s the basis of classics like Goodnight Moon and more recent titles like The Going to Bed Book. My first book, Goodnight Jesus, is an Orthodox bedtime book inspired by my own children’s bedtime routine that included simple prayers and kissing icons. Eventually, kids will internalize a sense of time. They’ll learn what a “day” is and won’t confusing a post-nap afternoon for a new day. They’ll learn that “almost done” means that they’re not going to starve before dinner is served. And when mom says “one more minute” while talking to her friend at the grocery store – well, better get comfy because mom’s sense of time can be off, too. My kids are a bit older now. At 8 and 5, they’ve outgrown the need for books that lull them with daily rhythms. They haven’t outgrown their need for those rhythms, though. They still mark the day with regular waypoints like meals, school time, play time, and bedtime. They’ve also not outgrown their need for love or their delight in a good bedtime story. I suspect they’ll never outgrow these things – I sure haven’t. 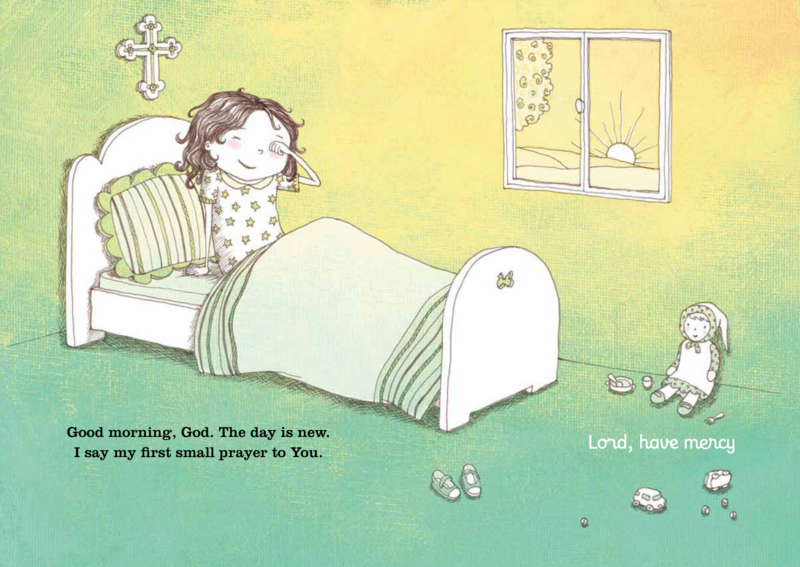 This post is part of a blog tour in celebration of my new children’s book, I Pray Today. Each day this week Angela will be blogging around the internet.